The school has the state of the art Computer lab-Gigabyte. The school ensures that the computers are replaced every few years to keep pace with the changing technology. The lab is well spaced out and can accommodate over 100 students at a time. The lab boasts of an exhaustive collection of educational C.D’s which are used as a teaching aid by the school faculty. Multimedia in education plays a pivotal role in our curriculum and we have a multimedia projection device which provides visual aid for three dimensional teaching. The projection system is installed in our auxiliary lab which is equipped with computers with TFT screens. The teacher’s cubicle is in the nucleus of the lab which houses computers for the use of staff members. All the computers are networked which facilitates practical sessions. Internet facility is provided to staff. Students are allowed access but only under guidance for project work. 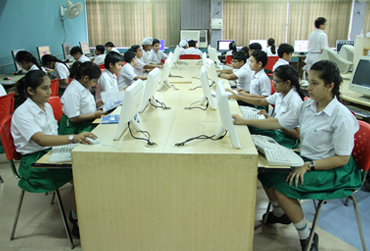 Computer education is mandatory for all our students from Class I-XII and the program of study is adapted every few years to keep our children up to date with the changing technological scenario. The computer lab is centrally air-conditioned.